This past week, we launched the third major update: Forum community awards. You will notice on people's posts that there are various little dots and awards by their names. We will be adding more as time goes on. What other features would you like to see on the forums that would make you inclined to use our forums more? We are gradually going around and promoting users so that they get more pips. It'll take a few months for that to get completed. I like the changes. They give each person a unique feel. It feels like you are rewarded (a bit) for being here and being part of the community. I'm indifferent to the forum community rewards feature. Very nice improvements. Thank you. Awesome work Noticing the difference already! Could we get a rare award such as "Liked by a Dev/Mod/CEO" or "MVP award" for any post or comment a dev/mod might find particularly insightful or that they think positively contributes to the forums and community ? I would like to see fixed the problem with adding pictures to a post. When I type my text, then add the pic, it shows up above the text. I have to arrow up, move the pic down via enter key, then move the text to the top. Been like that for months and months, maybe even a year or so. Irritating. One problem I see with that idea is that some join dates aren't accurate. Mine, for example. Since I changed my nick. Maybe that can be fixed then with the site update ¯\_(ツ)_/¯ ? Wow. The speed is insane. This was always the slowest loading forum for me until now. Thank you!! I love the speed and the rewards. What about creating Modding icon for Registered Modders? Is it possible to use larger fonts for mobile phone displays? I notice now that i use stardock forever, since i start use stardock skins on my windows. This new update its really cool. I have now used the forums almost daily for a year. This is a running feedback post. I will collect my suggestions here. Make stickied posts properly gain bold titles when they receive new unread posts and unbold titles when posts are read. Make new top-level post titles unbolded if the message is viewed. As of now, they only unbold if someone posts to them. Sometimes, new replies are made (and the username of the poster appears) but the reply is not visible in the post for a few minutes. Add a preview button. Sure, this editor is a WYSIWYG editor, sort of, but quotes don't appear correctly. Retain forum settings (in cookies?) such as when the pinned post section is collapsed. Allow posts to be merged. 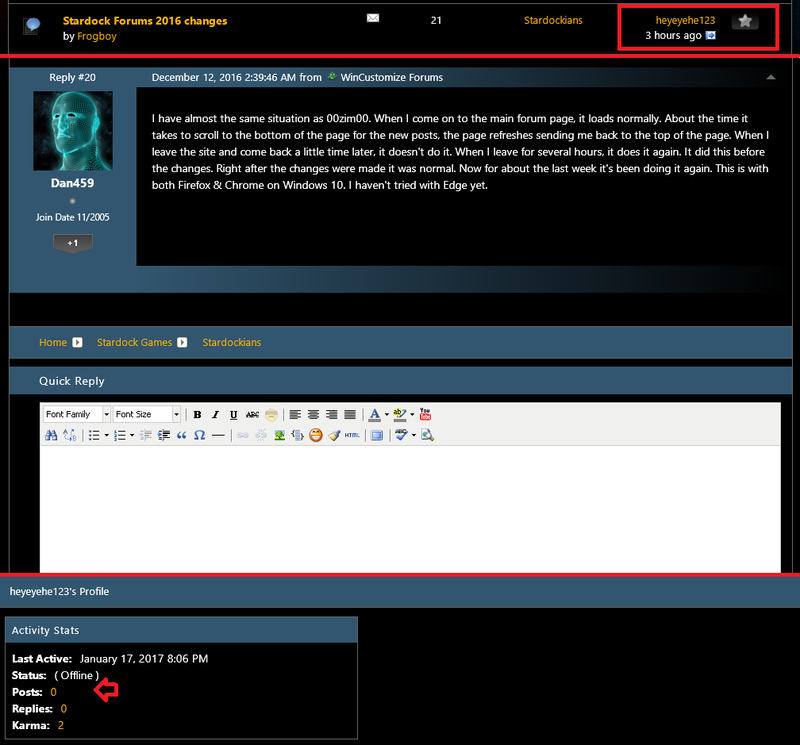 Allow non forums.stardock.net subforums (such as the hidden Star Control founders forum) to be visible via forums.stardock.net in order to override the custom GUI on those forums. Allow images to be resized without math by locking vertical and horizontal ratios. Nobody is ever going to post a picture here and reduce the image width by 50% without reducing the height by 50% as well. Of course I'm far too advanced a mind t-ooooh what's that green one? I gotta have it! Just a bug that has been happening since the update. Good point. You guys with Founders Badges need an award that recognizes that. As it is now, you have to go to the members profile page to see them. They need to be visible from the Forums IMHO. I have almost the same situation as 00zim00. When I come on to the main forum page, it loads normally. About the time it takes to scroll to the bottom of the page for the new posts, the page refreshes sending me back to the top of the page. When I leave the site and come back a little time later, it doesn't do it. When I leave for several hours, it does it again. It did this before the changes. Right after the changes were made it was normal. Now for about the last week it's been doing it again. This is with both Firefox & Chrome on Windows 10. I haven't tried with Edge yet. Im not sure if its because they just deleted post or if its another issue. But I have a notification for a post on this thread that wont go away. And the post itself wont show. Says 'heyeyehe123 posted 3 hours ago", i also got an email notification for it. On heyeyehe123 it says he has posted 0 Posts. It forum post in subscriptions is staying highlighted with a (1) notification. Edit: After i posted this the notification went away, im assuming this i because me being the last post overwrote the notification setting/counter. It was a spammer that posted and was removed from the site. Most of the time no-one notices the spammers....coming or going. Well that explains it , dam spammers!